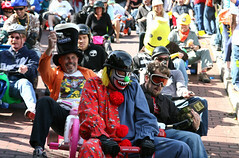 Yesterday, while eating and drinking in North Beach SF, I stumbled upon an event put on byJon Brumit called “Bring Your Own Big Wheel.” What a trip :-D Imagine adults, dressed up as super heros and other oddities, racing big wheels down a very steep, very windey road. There were a ton of wipe-outs and scrapes but everyone laughed it off and was proud to show their bruises. This event was non-stop fun. My collection of photos can be found on flickr. Chrissy is a Cloud and Datacenter Management & Data Platform MVP who has worked in IT for over 20 years. She is the creator of the popular SQL PowerShell module dbatools, and holds a number of certifications, including those relating to SQL Server, Linux, SharePoint and network security. You can follow her on Twitter at @cl. ‹ TrueCrypt Now Supports Vista! The LaughingSquid guys are great. 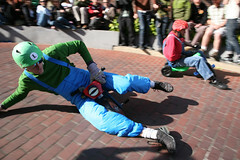 They also hosted the 2007 San Francisco Pillow Fight. Yeah! So sad I missed that..that was just down the street from where I work. There’s a theme I see, they do something crazy as hell each holiday..no matter how small. I can’t wait to attend the rest. Chrissy has been awarded the Microsoft MVP for her work both in the PowerShell and SQL Server communities. Daniel Gras on SQL Server System Processes Blocking User Processes when Auto Update Stats Async is Enabled.